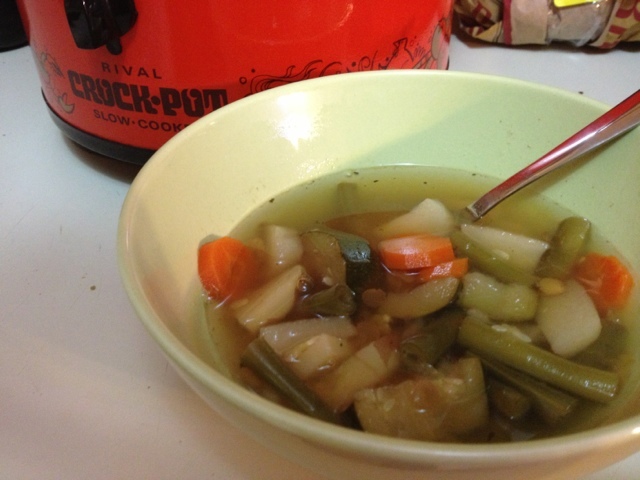 Yesterday was all cold and snowy, and what's better on a cold day than soup? I started with some vegetarian broth in the crock pot. I used about two cans. Then I seasoned it. I usually add anything from the cupboard that smells like it should be in soup. Like basil, salt, pepper, onion powder, etc. I would have added some broccoli, but we didn't have any. I let everything sit in the pot on high for about 4-5 hours and turned it on low for another 2 or so. It turned out great! Just needed a little more salt!